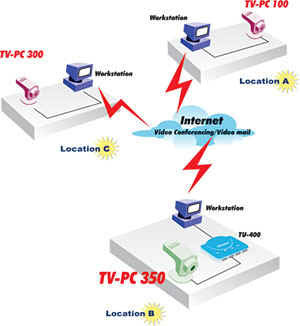 TRENDnet's TV-PC350 is a USB PC camera with 350K pixel CCD (Charged Coupled Device) image sensor. With its high resolution and clearness in picture quality, it combines state-of-the-art optical technology and complete audio-visual software with an affordable price. The TV-PC350 allows you to take snap shots, send video e-mail, record/edit video clip, and enjoy Video Conferencing via the Internet. While in Video Conferencing, you can do one-on-one chats or full video meetings with Group Chatting features. Get closer to family and friends with TRENDnet's TV-PC350 for truly memorable communications. Transmits 18 frame-per-second at 640 x 480 resolution (VGA). In Video Conference mode, you can do one-on-one chats or full meetings with Group Chatting features. Bundles with loads of video, photo editor software, and microphone. The Plug-and-Play feature allows you to just plug in the USB port, load the driver, and you are ready to go!